Saturday’s fight between Floyd Mayweather Jr. and Conor McGregor is a big moment for streaming video. Unlike Mayweather’s bout with Manny Pacquiao in 2015, this fight will actually be available on pay-per-view without a cable subscription. But to watch the Mayweather-McGregor live stream, you’ll have to pay the price just like cable subscribers do. Pay-per-view access will cost $100, and will be available through various streaming devices and services. That price includes the main bout and three preceding fights, which have a scheduled start time of 9 p.m. Eastern. What’s the frame rate and resolution? How many simultaneous streams are allowed per purchase? Can I pause, rewind, and replay the fight? Can’t I just stream the fight for free somewhere? Streaming through ShowtimePPV.com on the Chrome, Firefox, Safari, Internet Explorer, and Microsoft Edge desktop browsers, and on Chrome for mobile. 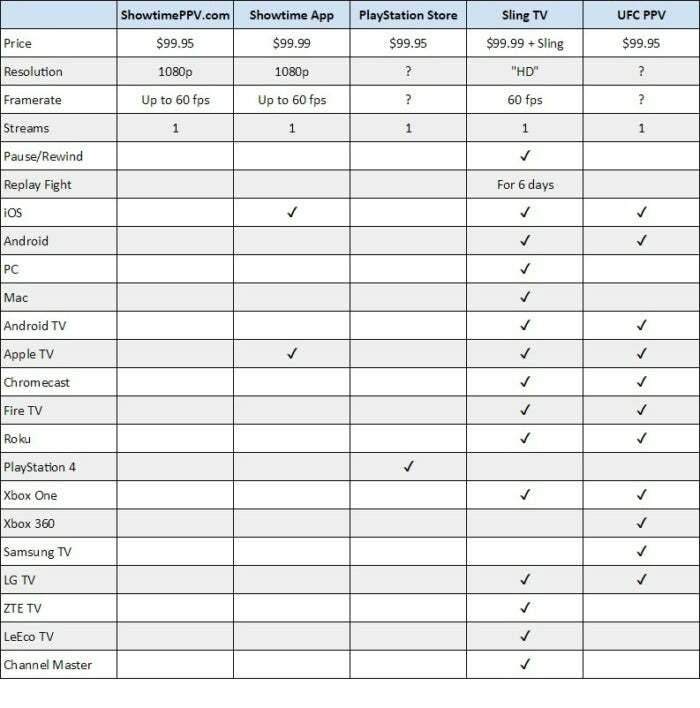 Through Sling TV on the web, PC, Mac, Android, iOS, Amazon Fire TV, Android TV, Apple TV (fourth-generation), Chromecast, Roku, Xbox One, LeEco TVs, ZTE TVs, LG WebOS 3.0 TVs, and Channel Master DVRs. According to a Showtime representative, the Showtime app and website will stream at 1080p resolution and at 60 frames per second if the device supports it. A Sling TV representative said the fight will be presented in “HD” and 60 frames per second. UFC, and Sony haven’t responded to my requests for comment. In any case, the stream is likely to lag a bit behind the live telecast due to the way online video currently works. So while the streaming option is nice to have, cable and satellite subscribers should probably buy the match through their TV boxes instead. Showtime’s website and apps will only allow one stream at a time per account, and a Sling TV representative confirmed the same. UFC has said in the past that it only supports one device at a time, and while I haven’t heard back from Sony, presumably the same restriction will apply on PlayStation 4. That means no watching on multiple televisions throughout the house or mooching off someone else’s account. To pause and rewind, you’ll need to watch on Sling TV, which will also offer an on-demand replay of the fight for six days after the event. The other viewing options are limited to just the live broadcast. While we don’t condone piracy, it’s probably a moot point given Showtime’s aggressive stance on bootleg pay-per-view event streams. 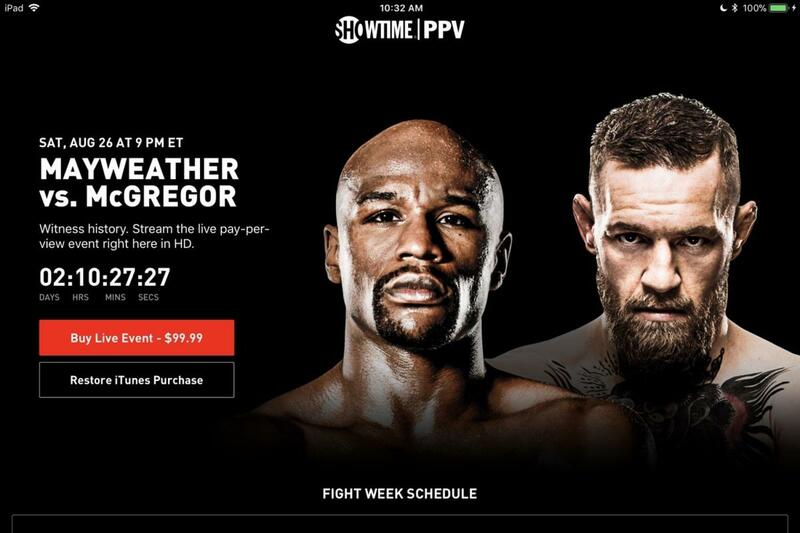 Reliable, decent-quality streams were pretty much impossible to find with the Mayweather-Pacquiao fight in 2015, and Showtime has already started suing websites that might traffic illicit Mayweather-McGregor streams this time around. Besides, there’s no moral ground left for freeloaders now that Showtime is offering legal streaming options for cord-cutters. If you’re reading this before Saturday night’s fight, consider choosing your platform and purchasing pay-per-view access ahead of time. Sign-up and billing systems can sometimes be a bottleneck for streaming services during high-demand periods, so paying now can help ensure that everything goes smoothly when the fight starts.